It is more than often when we get a bit lazy and sign into an app with our Facebook account. It is just because we find it a shortcut which prevents us from going through the cumbersome process of filling all the mandatory details required to make an account with that app. However, many few of us knows that this shortcut costs us a price of granting that app the access of our Facebook data. So, friends if you too have given implicit access to the apps then here we are with the article to remove the apps permanently from your Facebook account. Must Read: How To Receive Security Code For Facebook Account? Login to your Facebook account and click on the down arrow at the top right corner of the screen. Now from the drop down menu click on Settings. Now from the left pane click on Apps. You will see the list of all the apps with the linked to your Facebook account. Like in the below image you can see that I have provided access to total 59 apps. Now you have two options, either to remove that app or edit its settings. For removing the app click hover your mouse over the app, and click on “X”. 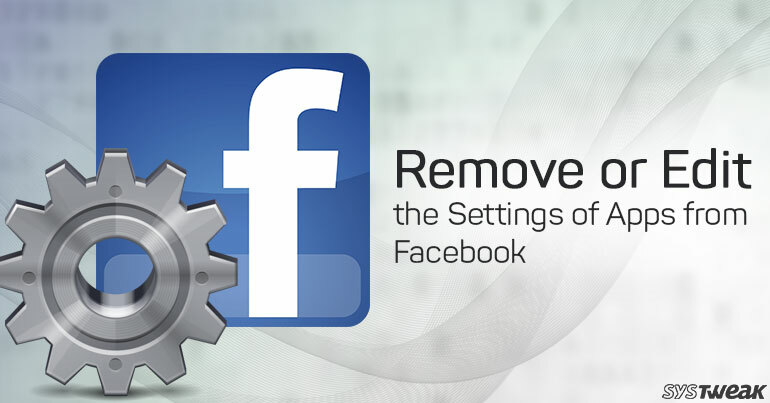 This will remove the app and from accessing your Facebook data. In the next prompt that appear click on “Remove” to complete the process. If you just want to edit the information you have provided to that app, then instead of clicking on “X” icon, click on pencil icon. Here you can find that which of the information is accessed by this app. Just edit the settings as per your choice, and once you are done it with click on save button located at the bottom right corner. However, there are certain apps which you have given access and they have posted photos or videos your Facebook profile. Therefore, for such apps, before click on Remove button remember to check mark the option of deleting all activities it has performed over your account. This will even delete the previous posts and videos posted by the app on your account. Though all this process is quite simple and can be finalized in few minutes, however there is still a catch in it. It is like, removing the app from your account does not mean that the data hold by these apps is automatically deleted. These apps still have the data with them which you have shared with them while providing the access. This data can be name, email address, your friend list, birthday etc. If you wish to remove that data, then you have to personally get in touch with that app provider and submit a request. However, now it is up to that app provider to entertain your request or not.